Neuss, Germany, 2nd December 2010 – Toshiba Computer Systems, a division of Toshiba Europe GmbH, today unveiled two models of its new netbook family: the mini NB500 and the mini NB520, a model for users who want a slim and stylish netbook with enhanced sound features. The mini NB520 is the world’s first netbook with embedded premium speakers from Harman/Kardon® for a superb entertainment experience with a vibrant sound. The mini NB500 and the mini NB520 will be available during the first quarter of 2011 throughout Europe, Middle East and Africa. 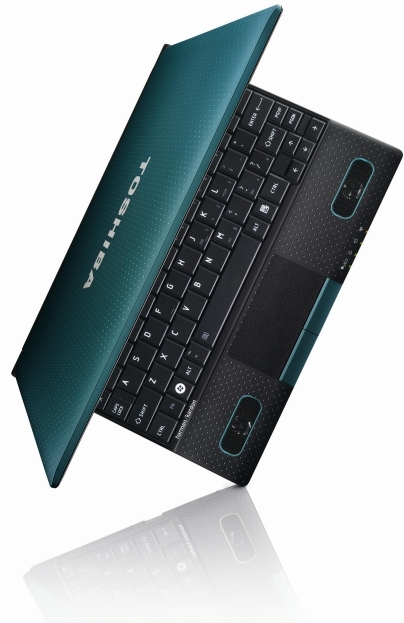 “Offering a magic sound experience by featuring the world’s smallest Harman/Kardon speakers on a laptop embedded in a slim and stylish casing, the mini NB520 meets a yet unfulfilled user demand in the netbook market”, said Marco Perino, General Manager, Product Marketing EMEA Toshiba Computer Systems Division. 81.4% of netbook users say that it is important that their device offers a good sound. More than two thirds of netbook users use the speakers when listening to music or watching videos while being alone at home, while around 40% do so together with friends. Despite its diminutive size, the mini NB520 packs a powerful sonic punch with its 2 watt Harman/Kardon® stereo speakers, giving sound volume and quality not normally associated with netbooks. They support Dolby® Advanced AudioTM to provide a natural sound experience while listening to music or watching videos in HD quality (720p) on the netbook. The Sleep and Music feature allows consumers who’ve stored their favorite music tracks on a MP3 player to connect the gadget to the netbook and listen to the music through the speakers without turning the PC on. While the mini NB500’s and mini NB520’s subtle look with shiny metallic reflections and engraved dot patterns is pleasing to the eye, the paint with its rubber textured feeling is appealing to the touch. A selection of five fresh colour variations - blue, brown, lime green, turquoise, and orange – give customers a wide choice to express their personality. The mini NB500 comes also in a black version. · 3x USB 2.0 including one with Sleep and Charge, 2-in-1 -Reader.